I have a problem on my hands and reputation. I’m a young, novice and self taught carpenter. As a casual paramedic I fill in the time and make money by building and selling furniture I make. I primarily build out of salvaged materials I find floating in the river near by, which is an old logging river. A few years ago I found a 50 foot 22×18 Douglas fir log boom floating in the river. 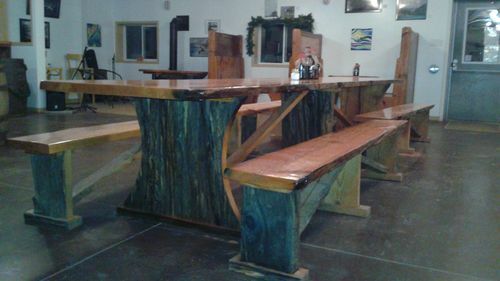 I had it sawn into 16 foot 2” slabs and let it dry in the barn. 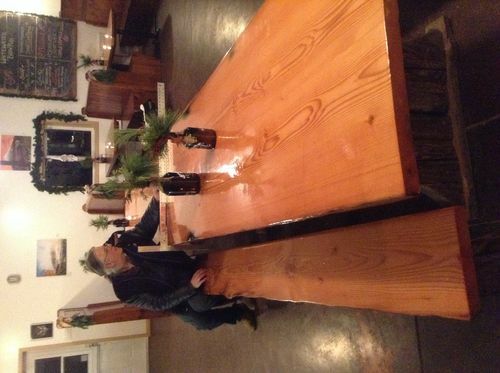 This past spring I was approached by a new brewery and restaurant to build a big harvest table. To make the story short it turned out to be a “splendid master” piece (not my words) with benches to match and 8 coats of epoxy to finish it off. Now here is the part where I messed up. In the rush of the restaurant opening I never put any finish on the underside of the table top (I meant to but got side tracked and forgot) and in one spot it is warping extremely bad. To be precise 1 inch of downward warp over a run of 9 inches most of which is in the last 3”.. This is right in the middle of the table and causes drinks to slide off the edge of the table if care is not taken. The ends are warping as well but not as bad ,1/4” over the 9 inches. 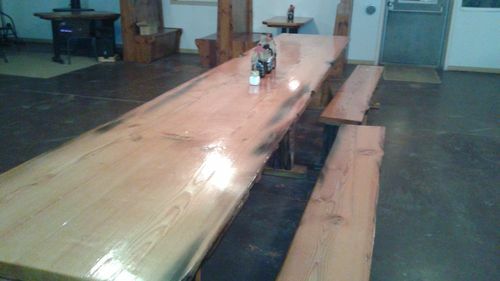 The table is 1 7/8” thick 16’ long and 34” wide made from 2 book matched slabs. I need to lessen the warp so that drinks stop sliding off the table. I resorted to taking the table apart, cutting 1 inch deep groves on the underside length ways and have started to wedge it back to straight. However this is not working as well as I was hoping it would. What I’m asking is for advice from someone who has dealt with this problem before. I don’t mean to sound rude but if you haven’t had to deal with this before please leave your opinions out of it unless you truly have a genuinely good answer. I’m prepared to take many trips to the restaurant and fix it bit by bit however I only have a few hours to work on it in the mornings before they open. If need be I can bring it back to my shop in February when they close for a few months. I know it will never be flat and that is not my goal, I just want to make it good enough it’s not a a hazard to patrons. Andy I think you might get some response if you post some pics of what your up table looks like. Many of us have different ways and cleaver ideas.I make lots of tables and have my ways.Chances are slim that you will find some one who make a table that large that has dipped on a edge. If your fighting Mother Nature and she wants her wood to move that way I think we know who will win. Dont come on here ask a question then demand the way or how we respond. There’s no easy solution to your problem. You dont seal the bottom of the table top so it can breath. I would suggest you cut the bad portion out and replace it. You may need to replace the entire piece. I would assume you didn’t let the wood dry properly. I would also suggest you reevaluate your drying and finishing methods. From what you said I don’t think you are going to fix this problem. AJ thanks for the reply. Here are some pictures. It’s hard to tell in some pictures how bad the dip is but the square helps. Wseand cutting out the bad section or replacing the board is not an option, thanks for the great advice. I was told waiting until next summer when the humidity increases will fix it. Thoughts on this advice? If it were my table to fix I would consider breadboard ends,It’s looks like you have long grain warp and maybe cupping across the width.So that maybe difficult or impossible. 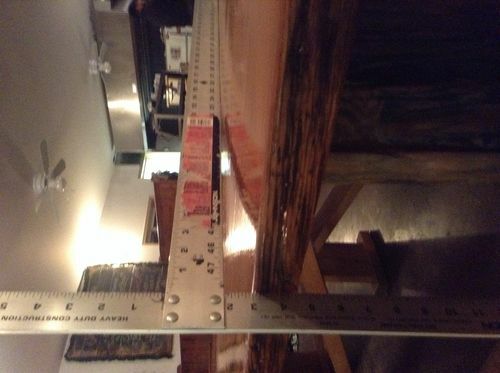 Place 4 – 2×4’s across the table with a 1/4” boards under the area that warping starts. Spray the bottom with water and clamp 1/8” at a time (every 4-6 hours) until it gets straight and slightly higher than table surface. Put a heater underneath and gradually un-clamp 1/8” at a time. Should take 4-5 days. Forgot… Put the finish on the bottom before un-clamping. Remove the top, strip it, let it breathe for a while, flip it over, plane flat, plug whatever holes you’ve got, seal it up all around, reattach. It’ll be thinner at the dip, which will now be a rise on the underside, no big whoop. Does your design allow for wood movement? Without battens or breadboard ends to hold the top flat if there is an imbalance in moisture flowing into the board, it is going to cup. 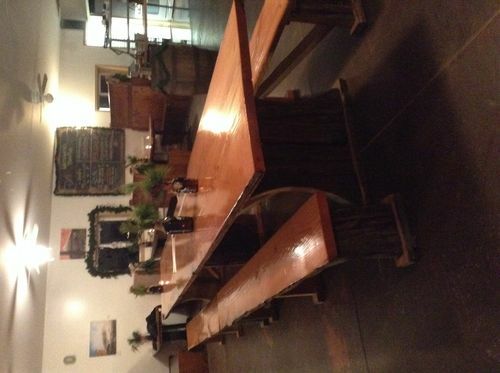 Beer will be spilled, the restaurant staff will wipe down the tabletop. You can slow moisture down, but it is still going to move in/out of that wood. So, a mechanical solution to keeping that top flat is going to be needed. If you don’t have battens on the top add them. You can do that immediately. Make them strong enough, and that might be all that you need to do. If battens don’t do the trick, you will have to remove the top and bring it back to your shop because the next steps are to plane out the cup and to refinish both sides of the tabletop. make sure both sides are sanded equal and put a finish on bottom. Basically, you’re SOL. You air dried it, but you did not let it acclimate to the target environment’s moisture content. You said Doug Fir, so I’m guessing you’re somewhere in the Pacific Northwest which gives you an equilibrium moisture content outside of between 12 and 14%. Compare this to the rough guestimate of 7-8% moisture content of wood inside a heated building. Wood only shrinks below 30% moisture content (the fiber saturation point), so that means when you moved it indoors it still had 20% of its shrinking to do. Whether you let it slowly acclimate on its own inside a warm dry environment like your house or workshop, or finish it in a kiln, you have to get it to the target moisture content. You probably would have been safe had you finished both sides of the table to seal in the moisture and prevent it from drying further. Basically the underside of the table is drying and shrinking, but the top isn’t. That’s why it is cupping downwards. And no, it is not reversible if you wait until spring. The only way you will get the moisture content to increase and take the cup out inside the building is if they tear the roof off and let it rain inside the building. Most conifers are forgiving to dry. Next time either find someone to put it in a kiln, or move it inside your heated dry wood shop or house to acclimate. You can kiln dry air dried lumber rather quickly without very much defect. I either finish drying them in my kiln, but leaning them against the wall in my basement for a month is just as effective and doesnt cost me hundreds more in electricity. My advice? Make a new top out of completely dried DF slabs. Get a moisture meter so you know where the heck its at in terms of moisture content. 9-8% should be safe to use indoors. Take the slabs that curved and put them back in the barn where you dried them. In theory it should slowly soak moisture back up on the exposed side until it goes back up to 12-14% MC. If and when it does that the table should be at the same MC on both sides and therefore be flat. Then seal the other side so it cant dry out again. You can do a lot of things with wood, but fighting the physics of how wood dries isnt one of them. I fixed it this past week actually. Did a bunch of research and planning and ended up reducing the warp to less than an 1/8 of an inch across the 34” width. To fix it I used my circular saw to cut saw kerfs 1 1/8” deep length wise on the underside of the table spaced roughly every inch and a half. Then I used steel tubing to sandwich the slabs flat. I did this over a week to ease the table into its new state. After it was flat I used the tubes as a guide to router a groove and recess 1/4” steel angle iron that is permanently screwed in place and mechanically holds the table flat. So far it has worked like a charm and from my research it should stand up to the test of time as now the table has room to expand and contract while being held flat. Attached is a picture taken after I reduced the warp. I live in Ottawa Ontario far far away from the Pacific Northwest. I found the wood floating in the river near by which used to be a big logging river. In the early 1900’s fir was shipped from the west coast across the country and used as boom logs to direct the more valuable hardwoods down the river. I hope you appreciate the journey that this wood went on and how hard it would be to get more henceforth making another top was never an option. Basically, you did the same thing someone does when they cut and bend a piece of wood around a radius. You cut kerfs deep enough so that you didn’t have to bend the entire thickness of wood. You still didn’t fix the problem with uneven drying though. If the humidity inside the restaurant stays constant, AND you sealed the bottom side to prevent moisture from further escaping, then you might be safe. Generally speaking, trying to constrain wide slabs from expanding and contracting is a very bad idea. I would know, I cut, dry, and sell wide slabs for a living. Usually what happens is the slab cracks apart as it tries to dry and shrink but is constrained. Thats why you typically want long slotted metal bars if you try to hold them flat with that method so the screws can move with the table. Its also why we have figure eight fasteners (google them). Like I said, you can fight the physics of how wood dries all you want but you won’t win. Its just like every old timers drying secret to keeping cookies from cracking. There is no secret. Theyre going to crack. They have to. Its how wood dries and shrinks. I hope your method stays together for the long run. I’ve seen some tables like that break apart. I ran your slab dimensions through the wood shrinkage calculator and going from 12% MC (outside) to 7% (inside) it will shrink in width between 1/4” to 7/16” depending on what part of the log it was from (radial or flat sawn). Thats why it warped on you. Next time either put it in a kiln for a week or two, or put it inside a warm dry environment for a few weeks before you use it to avoid these issues in the future. Happy woodworking and nice looking table. I have some slabs that I have already flattened and the design is such that I can not add any wood underneath to help keep them flat. I am wondering if you can let me know what thickness of steel you would use to keep a slab flat? I was thinking of recessing them and using steel that was a quarter” thick. Also…do you have any advice for cutting slotted holes so that the screw can move with the wood? Basically, you did the same thing someone does when they cut and bend a piece of wood around a radius. You cut kerfs deep enough so that you didn t have to bend the entire thickness of wood. You still didn t fix the problem with uneven drying though. If the humidity inside the restaurant stays constant, AND you sealed the bottom side to prevent moisture from further escaping, then you might be safe. Generally speaking, trying to constrain wide slabs from expanding and contracting is a very bad idea. I would know, I cut, dry, and sell wide slabs for a living. Usually what happens is the slab cracks apart as it tries to dry and shrink but is constrained. Thats why you typically want long slotted metal bars if you try to hold them flat with that method so the screws can move with the table. Its also why we have figure eight fasteners (google them). Like I said, you can fight the physics of how wood dries all you want but you won t win. Its just like every old timers drying secret to keeping cookies from cracking. There is no secret. Theyre going to crack. They have to. Its how wood dries and shrinks. I hope your method stays together for the long run. I ve seen some tables like that break apart. I ran your slab dimensions through the wood shrinkage calculator and going from 12% MC (outside) to 7% (inside) it will shrink in width between 1/4” to 7/16” depending on what part of the log it was from (radial or flat sawn). Thats why it warped on you. Next time either put it in a kiln for a week or two, or put it inside a warm dry environment for a few weeks before you use it to avoid these issues in the future. Happy woodworking and nice looking table.